Affordable, scaleable factory and process monitoring. Straight out of the box our Machine Information Gathering System (MIGS) provides affordable, scaleable factory and process monitoring. The MIGS system is designed to provide real-time monitoring of almost any cyclic manufacturing process. It is purpose-designed to suit small to medium sized production units from 8 to 32 machines within a single system. The scaleablility of MIGS is an obvious advantage to smaller businesses that can add additional machines as they grow without incurring major re-investment costs. 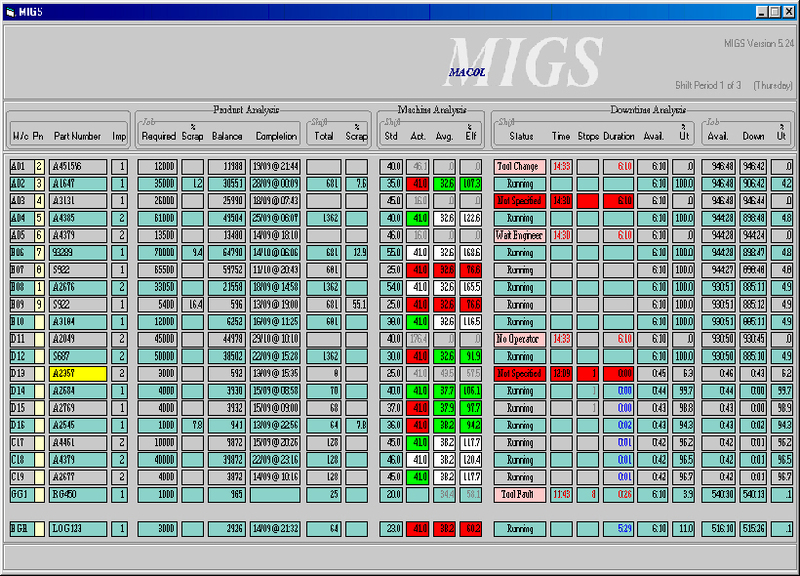 MIGS is supplied complete with software and hardware necessary to implement your factory production monitoring system. MIGS provides data capture based on 5 or 7 day working with up to 4 Shift Changes per day. MIGS is supplied as a ready-to-go system including software and Data Collection Unit and only needing the customer to provide cabling and the installation of the individual machine interfacing components (usually just a simple closing volt-free contact). Real time data of current cyle times, stoppages, time to completion, efficiency etc. 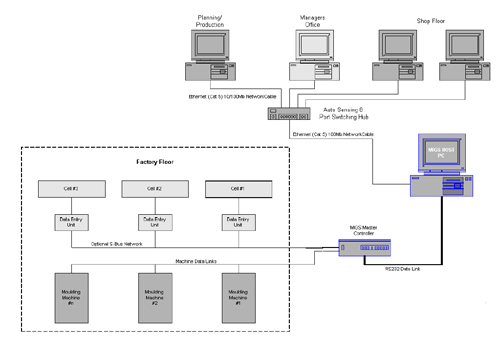 can be networked using PC terminals located on the shop floor, planning / production and manager's office. As well as monitoring the shop floor the MIGS system also provides data storage for products, materials and tooling. The real-time data from MIGS assists the efficient planning of production by providing constantly updated and accurate information about job completion times, allowing planners to schedule follow-on jobs, tooling and material changes and planned maintenance. MIGS internal database stores information about production plant, tooling and ancilliary plant, material requirements, as well as settings like temperatures and cycle times. MIGS provides accurate data for the analysis of stoppages. Machine stoppages are logged and timed and may be allocated by a supervisor to one of a number of causes.